I was sitting at one of my favorite spots in Tampa today and this topic came up so I decided to write a quick blog post about it. I took the above picture right before I started writing and I thought it was pretty cool so I decided to share! The phrase “in ketosis” tends to be loosely thrown around amongst keto enthusiasts. This is in part because of a misinterpretation of what this phrase means and the definitions given in the literature. Much of the research refers to being in ketosis as having elevated blood ketone levels to a certain degree. The issue is that some of the research suggests this is at 0.5mmol/L and other research suggests this is at or above 3.0 mmol/L. This type of thinking is part of the reason why we often chase higher ketone levels and freak out if we do not achieve them. This means that the real question should be how to know if you’re keto-adapted. The worst part about this is that there is no specific measure for knowing exactly when you are keto-adapted. Luckily, there are some tell tale signs! Weight loss is one of the primary reasons why someone may follow a ketogenic diet and while weight loss may happen rapidly initially, most of this weight is related to water loss. This initial loss of water tends to slow down after a few weeks of ketogenic dieting and some point after this we tend to see a more consistent decrease in body fat percentage. When this point comes you are likely pretty keto-adapted. It is worth pointing out that weight loss on keto can vary drastically from person to person. Increased energy is one of the most robust changes that some experience on keto. For me this is definitely true! Of course, I did not feel this way when I first started keto! Like most, I was very fatigued. However, once I was adapted to keto, I had a huge increase in energy. This is typically what happens when our body adjusts to utilizing ketones and this is a much better way to tell if you are keto-adapted. 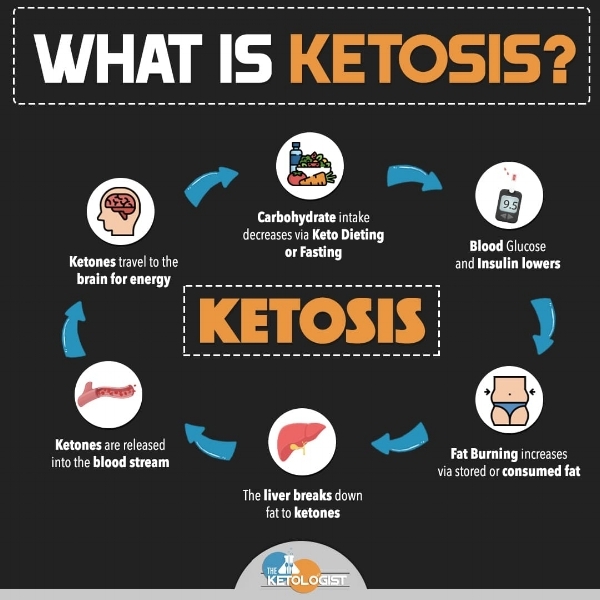 A quick refresher on how ketosis occurs! One of the contributing factors to weight lost on a ketogenic diet can be reduced appetite and cravings. When first starting keto, hunger and cravings are typically elevated, making it much harder to stick to keto. However, it is very common to experience a reduction in appetite and cravings once your body becomes keto-adapted. There are several mechanisms at play here, including stable blood sugar levels, changes in appetite signaling and hormones, and signaling from ketones. Regardless of the mechanism, if you are keto-adapted, chances are you are experiencing this! This is one of my favorite features of a ketogenic diet. When you are producing ketones and using them effectively, you will notice a drastic improvement in your cognitive function. This increase in cognitive function can lead to not only greater focus and concentration but also improved feelings of well-being. Interpreting your blood ketone levels can be challenging due to the numerous factors that impact them. However, testing them can be a great way to see if you are becoming keto-adapted. I do think that blood ketone levels vary greatly depending on your stage of keto-adaptation. I tend to see that beginner’s have higher ketone levels than keto vets and this is likely due to more efficient production and utilization of ketones that comes with keto-adaptation. Regardless, following your ketone levels and associating that with how you feel can be a good way to monitor the progress of your journey to becoming keto-adapted. It is worth noting that not everyone will feel all of these signs but it is likely that if you are staying true to the ketogenic lifestyle then you may experience at least one of these signs once adapted. Remember, that being in ketosis and being keto-adapted can take time and this time can range from 2-6 weeks or longer depending on the person!